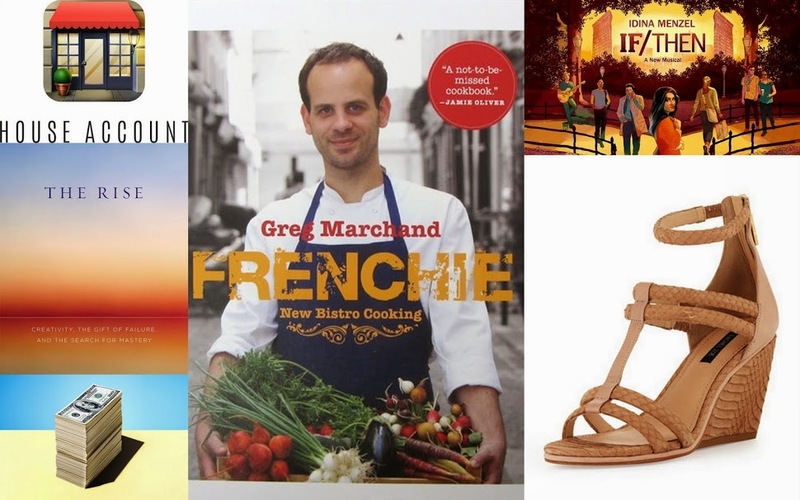 A play to watch if you’ll be in New York City this spring, summer or fall, wedges for the season, a French bistro cookbook to devour and more . . . The House Account app is an opportunity to connect you with your favorite small boutiques, as well as utilize their personalized customer service. With more than 300 speciality shops offering their inventory via House Account, you can stay up-to-date on new collections and arrivals, and have the opportunity to purchase before the goods are gone. Along with the ease of access, you will also be shopping local regardless of your busy schedule. Martha C. White in Time magazine offers up intriguing evidence from a recent study by Knox College psychology professor Tim Kasser titled Motivation and Emotion that offers insight in to the why regarding those of us who believe that materialism might increase our happiness. Have a look. I especially was drawn to Sarah Lewis’ book The Rise as she celebrates the gifts that failure provides and demonstrates through lists of successful people how indeed with courage and strength, often the most tremendous successes follow what is defined as failure. Just as I mentioned in yesterday’s Inspirational post, we must weather the obstacles, but so long as we persevere, amazing outcomes await. Idina Menzel of Frozen fame as well as the bewitchingly successful Broadway show Wicked which won her a Tony Award, offers her vocal talents to the stage again in Brian Yorkey’s tale turned musical (musical composition by Tom Kitt), If/Then. The only original script on Broadway this season, it is showing at the Richard Rodgers Theatre and just premiered on Broadway March 30th, running through October. The story of choice versus chance, it follows a woman at the age of 40 who returns to New York for a fresh start. Brian Yorkey, inspired by his own curiosity of how his life may have been different had certain circumstances not played out, addresses the question of parallel lives, and so Idina becomes Liz as well as Beth as her life takes two different paths. The essential question of whether fate or our very precise decision making determines our success, happiness and contentment certainly has me intrigued and if at all possible, I hope to have the opportunity to take it in. If you will be in the area, I think it would certainly be worth your time. Buy tickets here. Chef Greg Marchand’s Parisian restaurant Frenchie is quietly, yet certainly, demonstrating delicious new flavors that are less about heavy sauces and more about intense flavor and a co-mingling of a handful of international flavors. In his first cookbook which was released last Tuesday, Marchand shares his most inspired and personal favorite recipes (chutneys, flavored vinaigrettes, a watermelon with ricotta salata, and roasted carrots with oranges and avocado just to whet your appetite. Read more about how his culinary skills helped gain his future wife’s favor while they were dating here in his interview with WSJ. It is spring and that means, pedicures and sandals, and who better than to offer a stylish, chic wedge than the woman who knows glamour and California style – Rachel Zoe. My mom and I booked a spontaneous trip to New York awhile back for May and we always like to see broadway. After spending time googling, we bought tickets to if/then, not even realizing at the time who Idina Mendel is. Can’t wait to see the show!! It sounds fantastic.